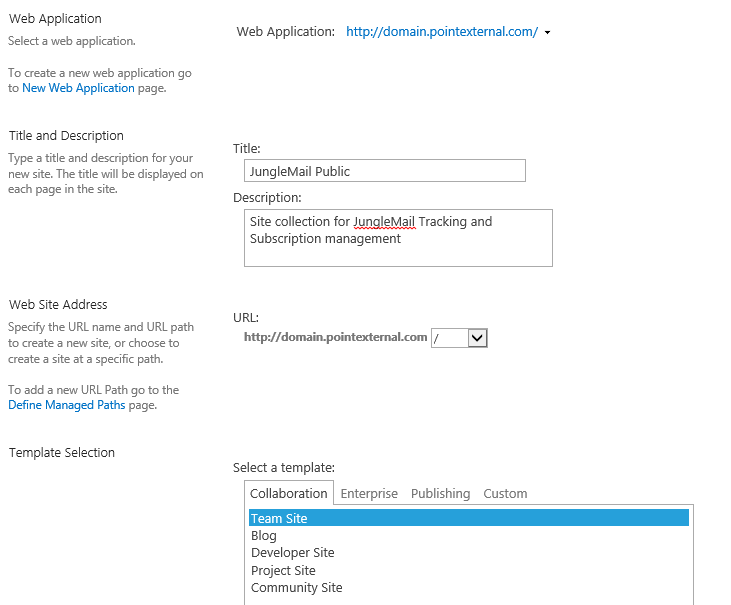 In order for JungleMail to track opens, clicks, and subscriptions of external users or users connecting via external or mobile devices, you will need to place JungleMail Tracker Web Part and JungleMail Subscription Web Part on an external SharePoint site collection with anonymous access. In this tutorial, you will learn how to create such a site. Note: if you are using JungleMail as an internal communication tool, it is not necessary to create an external site collection. You can put JungleMail Subscription Web Part and JungleMail Tracker Web Part in separate pages in your internal site collection. 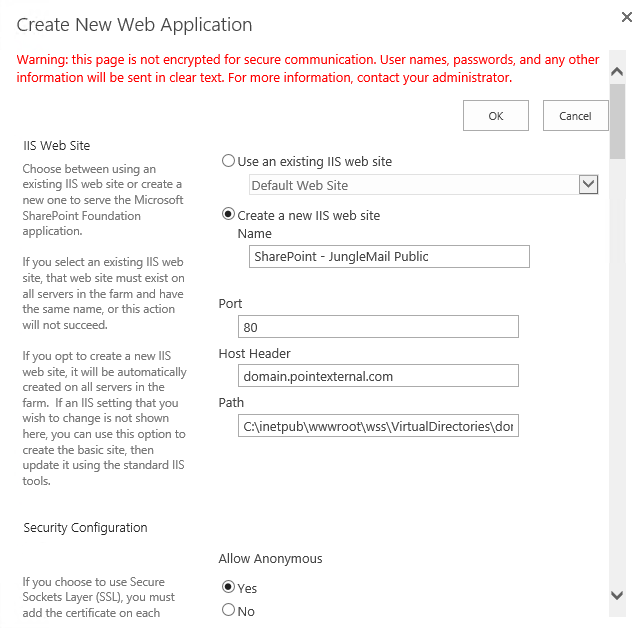 Just make sure that your recipients have Read access to the pages with the web parts and that this SharePoint site has been added to the Local Intranet zone in Internet Explorer security settings. 1. 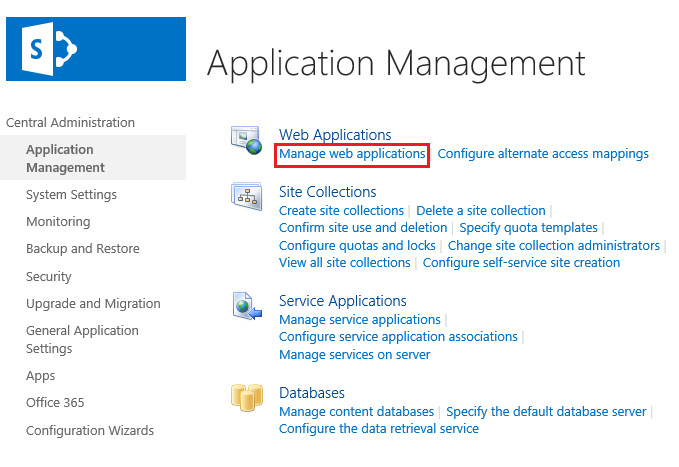 Go to Central Administration and click Manage Web Applications under Application Management. Leave default Classic mode authentication value. We recommend creating a new IIS web site and providing a meaningful name for it. Don’t forget to create a new Cname or host record in DNS according to the host header you specified. Authentication provider: we recommend using NTLM, but you may use Kerberos if your network requires it. You want to allow Anonymous Access as this is a public site. There is no need to enable SSL, so we recommend leaving the default value. Under URL section, you will see an address by which the website will be accessible. EnovaPoint recommends creating a new application pool for better security and site manageability. 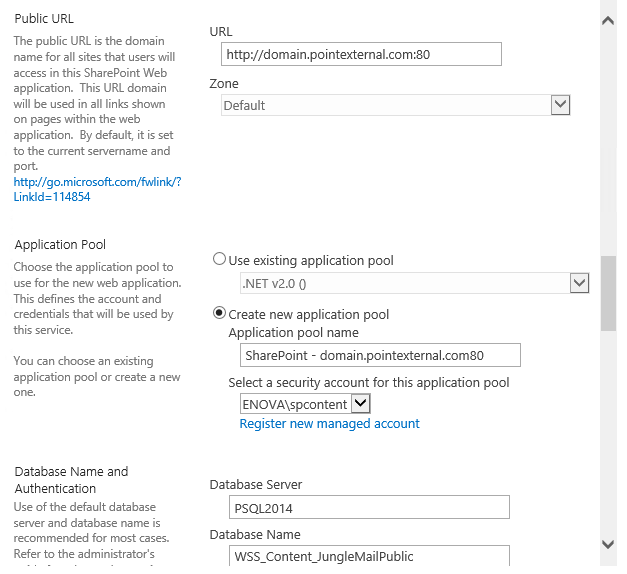 You may create a new application pool account and register it as a managed account in SharePoint. 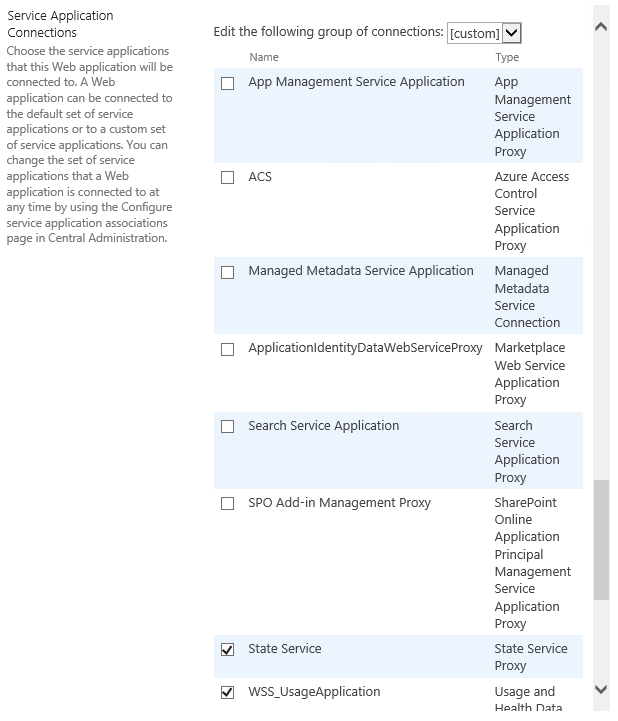 In Service Application Connections, select custom group of connections and disable all the unnecessary applications. 3. When all the settings are correct, click OK and wait for the new web application to be processed. 4. After creating the new web application, it can be verified in Central Administration. 5. It can also be verified in IIS. The web application has been successfully created at this point. 1. Go to Central Administration and click System Settings Manage > Farm Solutions. 2. Click on the enova.sp.junglemail.wsp solution. 4. Choose the previously created web application. 1. 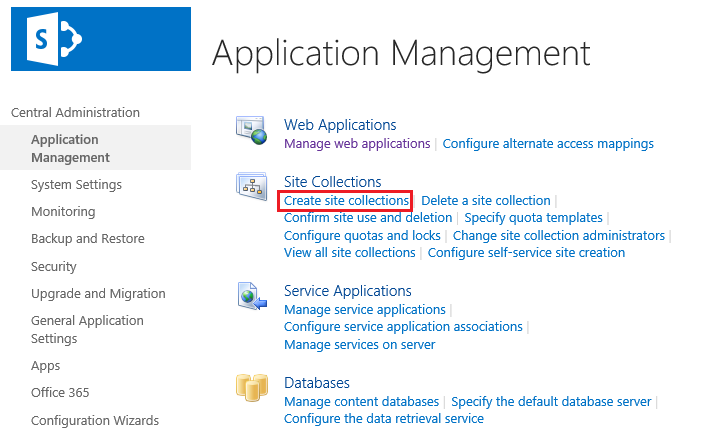 Go to Central Administration and click Create site collections under Application Management. 2. Select the previously created web application. 3. Specify a site collection title that reflects the purpose of the site and write a description that will appear over the ribbon. 4. For URL, we recommend selecting an explicit path. However, if you would like to use this web application in the future for creating new site collections, you should select a default path and click Manage path for creating multiple site collections. 5. Select the Team Site template. 6. 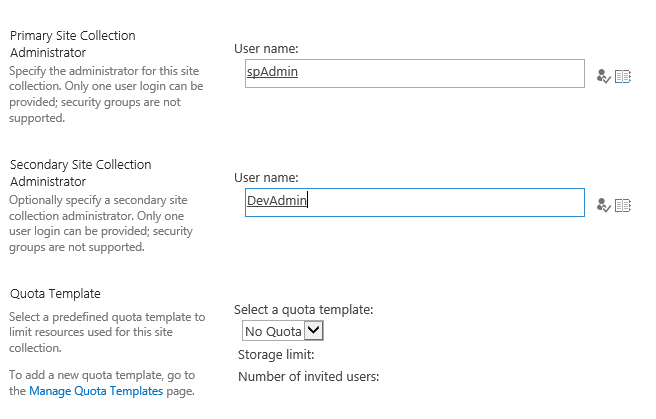 Specify site collection administrators to access the site in altering mode. No other users should be granted permission to alter the site. Please ensure these users have strong passwords. 7. Click OK and wait for the new site collection to be created. 1. To enable anonymous user access to the external site, open the site. Sign in as a site collection administrator. 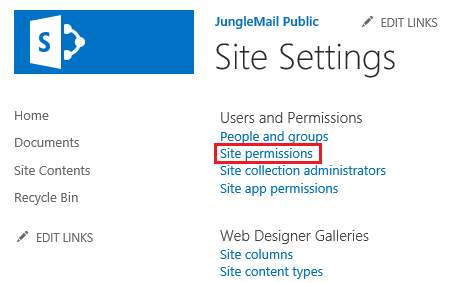 Under Site Actions, click Site settings > Site permissions. If you can’t open the site, please ensure you didn’t forget to create a new CName or host record in DNS according to the host header you specified. You should check your firewall settings, too. Entire Web site (anonymous users can view the entire content). Lists and libraries (anonymous users can view items only in lists and libraries that inherit permissions from the website). Nothing (anonymous users cannot access any content). 3. Select Entire Web Site and click OK.
1. Go to external site collection's root web site and click Site Settings > Site Collection Features. 2. Find EnovaPoint JungleMail Publishing Web Parts section and click Activate.